HOME > Books > Japanese > Manga > "Aa Ioutou" "Ningen gyorai kaiten"
Although this book of five wartime manga stories came out in 2006, four were originally published from 1968 to 1970 and another one in 1978. Masamichi Yokohama, who drew the manga pictures for each story, worked with four writers to create distinctive plots that depict a range of emotions during wartime. In addition to stories on Iwo Jima and kaiten mentioned in the book's title, one story entitled "Tokkou 3man meetoru" (30,000-meter special attack) portrays ohka rocket-powered glider bomb pilots who sortie from Kanoya Air Base in southern Japan. Although the stories exaggerate emotions and distort history, they give insights into the varied emotions of battle participants. "Ningen gyorai kaiten" (Kaiten human torpedo) has a flashback to the war when former Lieutenant Junior Grade Hazama, who was captain of a submarine that carried six kaiten, visits the former kaiten training base at Otsushima Island in Yamaguchi Prefecture. He remembers a fiery young kaiten pilot named Yosuke Akashi, who often got teased by others at the base because his father had become a prisoner of war in China. A group of young men from Tsuchiura Air Base arrive at Otsushima to begin training in September 1944 on kaiten human torpedoes, carried into battle on top of I-class submarines. Akashi becomes infuriated when not selected for the first kaiten squadron of six men. He tries to commit suicide by lashing his feet together and jumping into the sea, but Hazama rescues him and tells him not to die uselessly. After the first kaiten squadron achieves success in an attack on the American fleet at Ulithi on November 20, 1944, Akashi gets assigned to the second kaiten squadron. He gets a short leave to return home to see his mother and younger sister in Tokyo, but he finds his home destroyed and his mother blinded from American bombings. In a fanciful account with no connection to actual history, the second kaiten squadron achieves great success when five kaiten hit and sink several American ships, including a large aircraft carrier. However, Akashi's kaiten fails to move from the submarine, so he feels distressed afterward despite his squadron's huge success. When enemy fighters try to attack the kaiten base on Otsushima, Akashi takes a machine gun and shoots down one of the planes. The base commander asks him to join the next kaiten squadron, and he readily accepts. He receives a visit at the base from his younger sister, who informs him that their mother has died in a B-29 bombing. The submarine carrying the six kaiten torpedoes for Akashi's squadron spots a group of American ships heading toward Okinawa but gets detected by a destroyer, which starts dropping depth charges. Akashi volunteers to use his kaiten to attack the destroyer, and he successfully sinks this enemy ship and saves the submarine and crew. In the current day, Hazama kneels before the Kaiten Monument on Otsushima Island as he remembers Akashi's bravery. "Akashi! If only there had not been a war, you surely would have devoted that youthful passion even more for the benefit of others. But the deaths of you and your fellow kaiten pilots became the foundation of the peace we have in Japan. So that your deaths will not be wasted, we must never again go to war. The errors of the past . 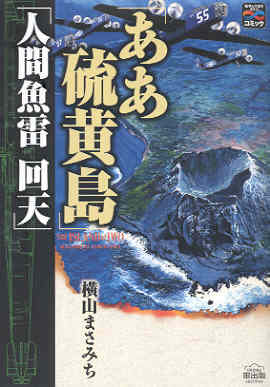 . ."
"Tokkou 3man meetoru" (30,000-meter special attack), the book's shortest story with 30 pages, tells about a young ohka pilot and his father who commands the second squadron of Betty bombers, with ohka gliders attached underneath, after the first squadron of 18 bombers with ohka gets completely wiped out by Grumman fighters on March 21, 1945. The title refers to the 30-kilometer gliding distance of an ohka when released from an altitude of two kilometers, but the glider also had rockets that could increase the distance and speed. The son complains to his father about the lack of a new counterattack strategy and the uselessness of the ohka attacks based on the destruction of the first ohka squadron, but his father firmly tells him that the orders come from headquarters and he should not criticize them. His son misses the sortie of the rest of the ohka squadron when they take off one hour earlier than previously announced, but he soon takes off and hits an aircraft carrier with his ohka glider bomb. The book's other three stories do not relate directly to suicide attacks. "Aa, Ioutou" (Ah, Iwo Jima) tells the grim story of the destruction of Lt. General Kuribayashi's army that defended the island of Iwo Jima by using a series of underground tunnels. One soldier befriends a young Japanese boy who lived on Iwo Jima, and the lack of fresh water on the island symbolizes their suffering. "Rousoku to kanoke" (Candles and coffin) portrays two brothers as pilots in the Navy who constantly quarrel. They both survive the war, and one of the brothers dies after his plane crashes in a violent storm just after delivering serum by parachute to storm victims on the small island of Hachijojima. 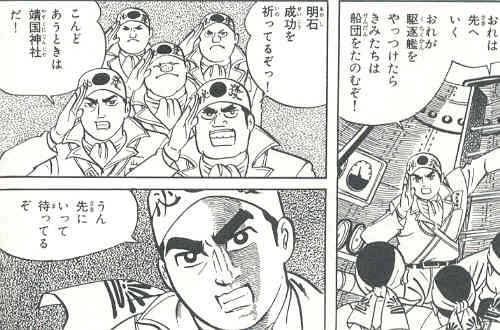 The last story, entitled "Narazumono no kunshou" (Medals for the good-for-nothings), depicts a band of four men who have gathered together after not making it in regular military units. They undertake a daring mission to rescue an important general being held by the enemy on a small Pacific island. One member of their group, a former kaiten pilot, saves them from a destroyer's depth charges when they are fleeing in a submarine. He straps explosives around his waist and swims toward the destroyer to detonate them and sink the ship.